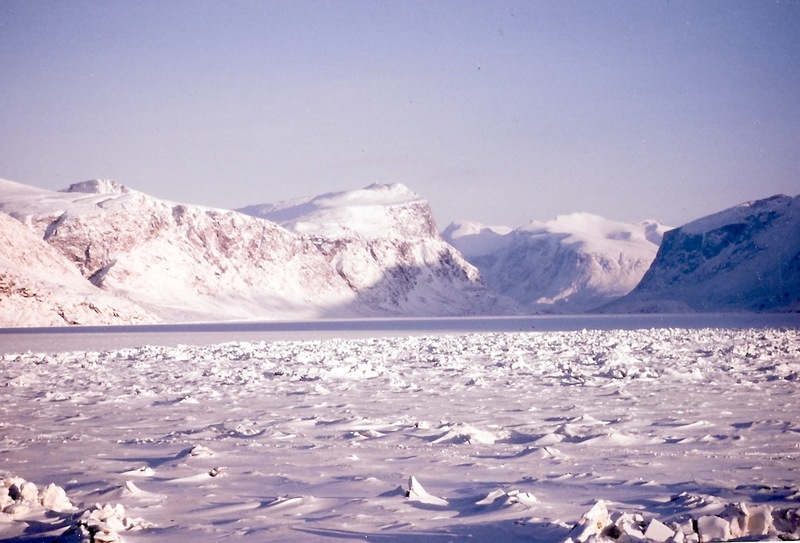 I decided to return to Pangnirtung in the middle of February 1994. The sun had just begun to come back into this Baffin Island community. For months, the sun had lingered below the horizon. Now it was rising higher every day. In mid-afternoon, a bit of sun peeked over the ridge of the mountains, casting long shadows in town. Most of the day, the snow-covered mountains still hovered in a perennial dawn. They were pinkish, with constantly changing flashes of yellow. I never tired of this vista. One day, we took a walk out on the frozen fiord, among the blocks of ice that created a cold, white forest. 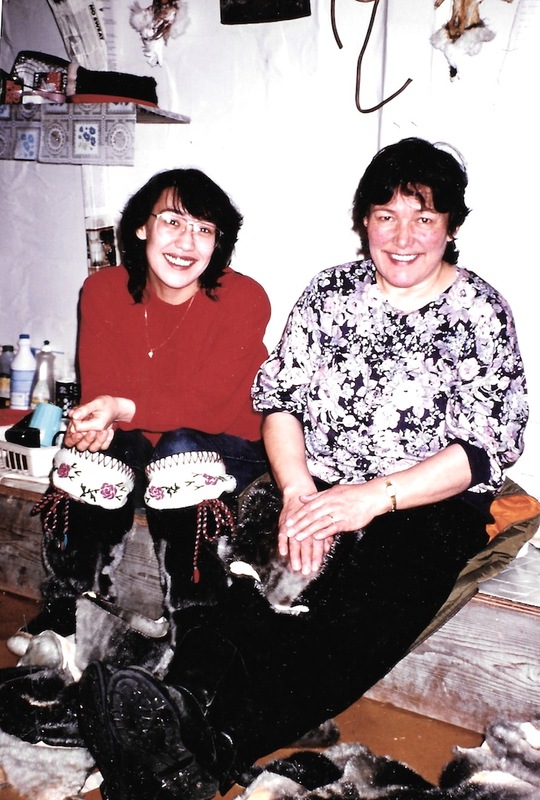 Margaret Karpik, the director of the Visitors Centre, took me to visit her mother, Ida Karpik, a well-known artist: I was doing a report for CBC radio on the revival of sealskin trade. Ida and a few other local women were gathered in the qammaq, a traditional tent-like structure, to work sealskins and sew. On its ceiling and walls, old newspapers and catalogues had been glued, helter-skelter, for wallpaper. In the corner, in the stone qulliq lamp a low fire burns. Moss was used as the wick, seal oil as the fuel. With Margaret helping to translate, Ida explained why sealskin was ideal for clothes, especially for jackets or boots that are warm in the cold and waterproof in the damp weather. The hard work it takes to make sealskin into clothes is worth it, she said. I also spent a peaceful afternoon scraping a skin, watching her and the other women work and listening to their conversation. In Pangnirtung, two local men were also trying to revive trade in sealskins. Only 15 years earlier, the market for sealskins had been strong, but that was before environmental lobby groups protested against the annual seal hunt and the United States slapped a ban on the import of sealskins. From Baffin Island alone, Inuit used to sell 15,000 sealskins. By the mid-1990s, not even a tenth of that amount were sold. But Jaypeetee Akpalialuk and Michael Murphy told me they were planning to send skins over to Hokkaido, in Japan, where the Ainu, the indigenous people of northern Japan, would use them in their clothing and handicrafts. Akpalialuk was then the mayor of Pangnirtung. Without seal meat, he told me, Inuit would never have been able to live in the North. It would be too cold without sealskin clothes to wear, and seal to eat, he said. Akpalialuk said critics of the seal hunt have it all wrong: Their seal harvest doesn’t even make a dent in the population. “As Inuit, too, we’ve never been over-killing any species up here. Outsiders have been harvesting our species. Europeans came over to Baffin Island in the 1800’s and over-killed the bowhead. We never overkill. We always managed the resources according to our knowledge,” he said. And Inuit aren’t inhumane, either, he said. They don’t kill seals like Newfoundlanders: They nearly always just shoot them quickly with a gun. Although the elder Etooangat had told me Inuit also used to hunt seals with hooks, one thing was certain: The seal ban had been a disaster for his community. “Most Inuit were depending on hunting sealskins for a living, it was the major income for Inuit. Once the market was killed, people suffered. There’s not too many jobs up here, they couldn’t buy food, purchase equipment, so some of them had to depend on welfare. The way I see it, the government of Canada didn’t do too much about it. I guess they didn’t care,” Akpalialuk said. Akpalialuk and Murphy took me to the sealift container where they were storing sealskins. Murphy, then a singer and local cable television company owner, said he thought that Canadians are ready for sealskin. But their project to renew the sealskin trade never took off. Two years later, Akpalialuk was dead. He drowned in a drainage ditch in Kuujjuaq, while intoxicated — his death one of a string of alcohol-related deaths that year which led this Nunavik community to clamp down on liquor sales. Murphy ended up in Ottawa, where, at one time, he faced charges of arson connection with the burning of a small privately-owned fish plant in Pangnirtung. The timeless triangle of the mountains at the end of Pangnirtung’s fiord remains the same, and Inuit continue to face obstacles to marketing sealskins abroad. And everyone still takes seal hunting seriously. “The seals are on the ice” was one of the first phrases I ever learned in Inuktitut. The next instalment of “Like an iceberg” goes live April 15. You can read the first blog entry of “Like an iceberg” from April 2 here.